Floor Planner software is a web-based or “cloud computing” design program that allows you to create an event, layout all your details and then share your plans directly with others. You can share your plans directly from your website, blog, Facebook or email. Create great plans for your rental space and embed the floor plans seamlessly within your website or other portals. Create tradeshow, corporate meetings, after-hours lounges, wedding banquets and more. To launch the floor planner software, you will need to go to your “Floor Planner” page on your website. When you first open the page, the login dialogue box will appear. Enter your user name which is also the email address you used to create your account. Then type in your password and click on login. Click on the box that says “remember me” and your information will always be saved. But, if you do not set it up to be remembered, you can click on the “forgot password?” and that will bring you into another screen where you can request your password to be sent to your email. When you first open the floor planner, you will notice several different options of tools that will assist you with creating your layout. To the left you will find your “Assets panel.” Right next to that will be your “Tools panel.” Along the top is where your “Button bar” is located. To your right is the “Properties panel.” At the bottom of your screen is where you’ll find your navigation bar which will help you work your way around the main stage which is located in the center of the screen. First you will want to decide what size you want your main stage to be. If you already have a drawing file open, you can change the size of your main stage without leaving your drawing space. Once you’ve decided on the dimensions of your layout, go to your properties panel and put in the width and depth you would like your space to be and it will readjust. Once you have your main stage set to the size you want it, there are a few standard tools to have in the setup of your drawing: a grid, dimensions and text. First, go to your properties panel to set your grid size. Then, add the dimensions to your space and drag and drop the text tool to add text as needed. Your navigation bar is located below the main stage to the left of your properties panel. There are two features on this tool, the zoom slider and the pan button, which allow you to zoom in and out along with the ability to move around your main stage space. The zoom slider (F-1) allows you to gradually increase or decrease the space on your screen where your main stage is. The pan button (F-2) allows you to gradually pan over your space. You can also hit the center of the button and it will bring your space back to the original visual setting you had it at before experimenting with changing the size. If you click on your screen, you can also “free-form” pan around your space. To move around your main stage space using your keyboard, just click on the up and down arrows on your keyboard. Your collapse button is the arrow next to your panels. This button allows you to close or “collapse” the panel to open up your viewing space on your screen of your main stage. The “Assets panel” collapse button is at the bottom to the right, the “Button bar” is below it to the left, and the “Properties panel” collapse button is at the bottom to the left. To re-open the panel just click on the arrows. 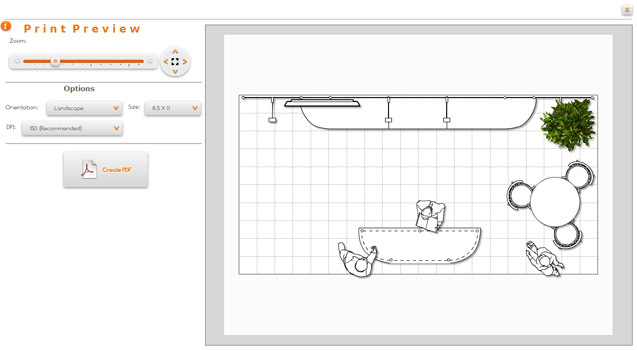 The way to dimension your drawing is by using the “ruler” feature which you will find on your “Tools” panel. 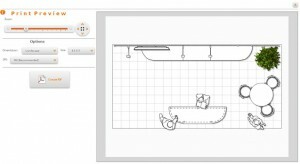 Drag and drop your ruler into your drawing space. Line it up with the object you are dimensioning and start at one end while stretching it to the other end to complete your dimension. When you click on the dimension you will notice that your properties panel has information about the dimension you just added. Click on “thickness” to change the dimension lines appearance. If you want to change the font, click on “font size.” If you want the text on the dimension line to be a different color, you can click on “foreground color” and add a new one. There are several features to help you with positioning and adjusting the appearance of your text. If you want to move your text around your main stage, click on the center grip on your text box and you can move it around freely. You can adjust the width and the height of the box in the properties panel. To rotate your text, click on the “rotation” symbol. If you don’t want the text to be moved around, click on the “lock” button. If you want to change the color of your text, click on “foreground color” and then click on the color palette to choose a new look. You can change your font size by adding a new number in the “font size” box or click on the arrows next to it. If you want to array your objects in a predetermined space, the array zone tool is the feature you will want to use. The first thing you’re going to do is drag and drop your “array zone” into your main stage and stretch it to the size you want it to be by clicking on the grips. Then, bring the object you want to array into your main stage, click on that object and then click on the “room arrangement” icon on your button bar. A dialogue box will appear and in the upper right hand corner you will see a box that says “select array zone.” Click on that button and it will open up a screen that you can see your main stage along with the array zone. Click on the array zone and then click on the “show window” button. Once you’re back in the dialogue box, scroll down and click on the button that says “draw” and it will start to generate your layout in the preview. If the object you arrayed is rectangular, you’ll see the object is lined up in rows and they fit within your array zone. You can adjust the spacing by adding in new dimensions in the column on the right. If your object is round, you will have the option of creating a “honeycomb” layout or a “grid” layout. You can also adjust the distance from the walls and in-between the tables by adding the dimensions in the right column spaces. When you’re in this dialogue box you will also see the number of tables in your layout. That number will change if you adjust the spacing in-between the tables. If you like how it laid out, click on the “group” button and then hit “submit” and it will bring you back to your main stage where you’ll see the objects slowly lining up in your drawing space within the array zone. You’ll also notice that each item is numbered now which is helpful when planning an event. When you’re finished using the array zone, click on the array zone itself and hit the delete button to remove it from the main stage when you are finished with it. If you have a specific dimension in mind for the area your items will be located in, then there is another way to array your object. Click on the object you want to array and then click on the room arrangement icon. Once the dialogue box opens up, instead of clicking on “select an array zone” go to the height and width boxes and enter the dimensions that you want the object to fit in. Then, scroll down and hit “draw” and it will generate a new layout and you’ll preview your object fitting within that space. If you like the way it lays out then click on “group” and then “submit” and you will see the objects appearing in your main stage in the arrayed pattern that you just generated in the preview. If you want to move the grouped objects around, just click on them and reposition. Note: You will notice that the items start lining up at the bottom right hand corner of the original object you placed in the main stage. Click on the polygon wall and your properties panel will appear to the right of your main stage. To give your wall a name, go to the “label” section of your properties panel. You can add height by entering a number into the height box or moving the arrows. You can change the thickness of the wall as well. You can change the font size of the dimensions by typing in the font box or adjusting the size with the arrows. You can also “lock” your wall so you don’t accidentally move it. If you want to elevate your wall, click in the elevation box and add a number or use the arrows. Note: To delete your polygon wall, click in the center of the enclosed wall and hit the “delete” key on your keyboard. When you want to permanently remove an item from your layout, click on the “delete” button on the button bar. The only time you need to use the “delete” button on your keyboard to remove an item, is when you want to remove a “polygon” wall. To copy an object, click on the object and then click on the “copy object” button on the button bar. If you want to go into your 3D viewer, just go up to your button bar and click on the 3D icon. Note: You must save your work before entering the 3D zone! For more specific information on your 3D viewer feature, go to “The Joys of 3D” section of the user manual. The order you bring your items in is a very important part of creating your layout. Items can end up on top of each other if you bring in an object too soon. This is where “level hierarchy” command helps you to organize your objects. The first button is “bring to front” which will bring the item that you selected all the way to the front. The second button is “bring forward” which will bring the item forward one level. The third button is “send to back” which will send your object to the farthest level backwards and the fourth button is “send backward” which brings the object back one level. The “group” button is a feature for grouping several objects and making them one entity. This is helpful when you want to delete, move or change a layer of several items at the same time. Just click on the “selection window” button on the button bar, window your objects and then click on “group” on the button bar. If you want to “ungroup” the items, just click on the “ungroup” button on the button bar and they will go back to a single entity. 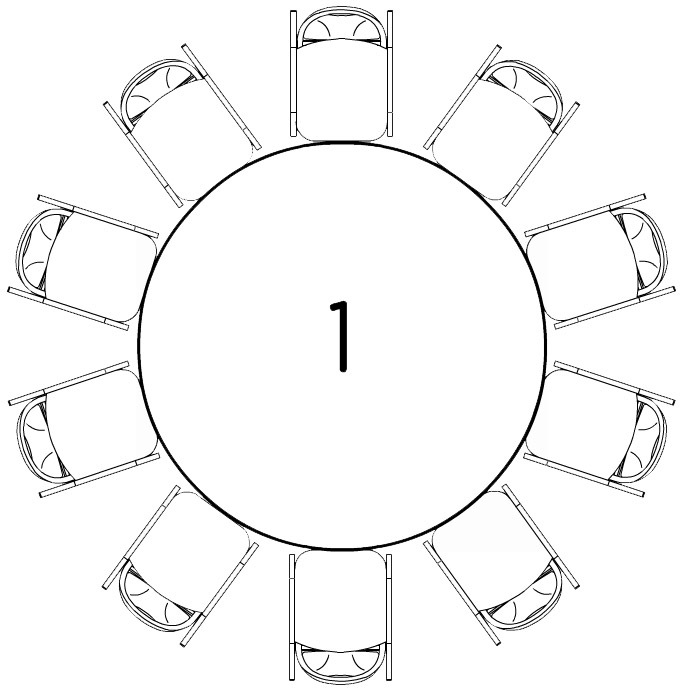 To layout a round table with chairs, drag and drop your table into the main stage, click on the table and then click on the “table arrangement” icon. 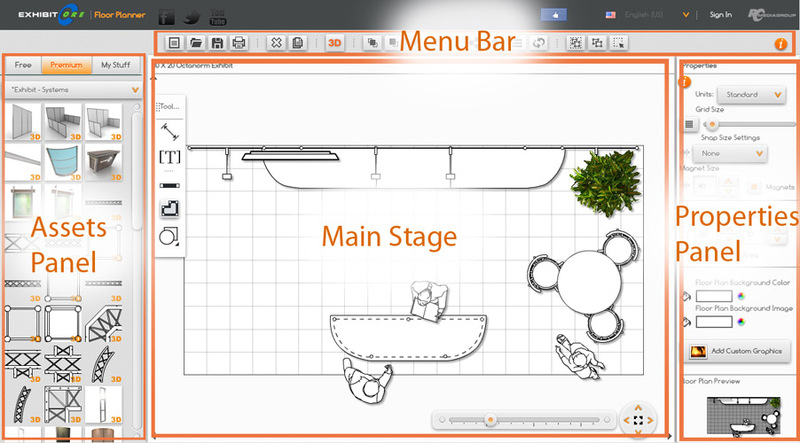 It will bring you into a dialogue box where you can preview the table with chairs. If you want to change the number of chairs go to the column on the right side and slide the bar where it says “chairs.” You can change the distance the chairs sit from the table by adjusting the “distance” bar. If you want to put in a different type of chair just click on the drop-down menu under “chair type.” Once you’re happy with your layout, click on generate and your table and chairs will appear on your main stage. To layout your objects in your room, you will be using several different features. Start by bringing the “array zone” onto your main stage. Stretch the array zone to fit the space you want your objects in. If you’re using an asset, drag and drop the asset off to the side of the array zone. If it’s a table and chair set up you already created with your “table arrangement” tool, then move that item off to the side away from the array zone. Click on the item you want to arrange in the room and then go to your “room arrangement” tool on your button bar and that will bring you into a dialogue box. Click on “select array zone” and it will bring you back to your main stage where you will then click on your array zone. Click on “show window” and it will bring you back into dialogue box. Then click on the “draw” button at the bottom and you will get a preview showing your objects arranged within the “array zone” space you created. If you like how it looks, hit submit. Your assets panel is to the left of the main stage. This is where your items or objects are located. Whether you’re looking for tables and chairs for a meeting room or a stage for a reception hall, the assets panel is where you’ll find these items. The assets that say “3D” next to them are items that are 3-dimensional in appearance. Your rental items are in the “rental” section of your assets panel. If you’re looking for something in your rental inventory, this is the section you will find them. The rental items can only be accessed by Administrators, sale team, and administrative staff. The client is not able to access these items. Any generic item that a client may need to use as a placeholder in their layout will be in the “general” assets section. These items are not connected to any inventory list. My stuff are items YOU added to the assets inventory. They are items that you or your company use and want available for when you’re working on new or existing layouts. Your “snap” command (F-5) is to assist you in “snapping” into set increments on your main stage. If you want to move your wall or an object a certain distance, just click on “snap” and set the dimension you want items to move to while you’re moving them around. If you have a space that you want to find out the “area” or overall square footage of, just click in the space and refer to your properties panel (F-8). Note: If you change the size of your space by adding a new dimension to your width and height box, you will notice the “area” change as well. If you want to add a color to your main stage, just go to your properties panel and click on the “floor plan background color” (F-9) box. A dialogue box will appear with the full color spectrum for you to choose from. If you want to add a custom graphic to an object, just go to the “3D add custom graphics” box on your properties panel. A dialogue box will appear and you have a few options for adding graphics. You can either click on your drop-down menu and pick from an existing graphic that you may already have in your graphics library or, click on “upload new” and when the dialogue box opens up,click on browse to view the graphics you have stored on your computer to use. Once you choose the image you want to use, you can crop it to the size and look you want it to be.Use the zoom tool to manipulate the size of the picture. You can touch the screen with your cursor and manually move the picture around until you have it positioned to where you want it cropped at. You can add a label to the image for future reference. Click on the “crop” icon and you will end up back in your main stage. Click on save and go back into your “add custom graphics” box. Now that it’s saved it will appear in your drop-down menu. Highlight it and click on “assign selected graphic” and it will appear on the left side of the dialogue box. If you decide you don’t want to use that graphic, click on “clear” and it will be removed. If you like how it looks, click the OK button. If you have a graphic, sketch or drawing that you want to bring into your main stage, you have the ability to upload it into your graphics library. This works well if it’s either a jpeg or pdf. Go to your “add custom graphics”button on your properties panel and you’ll be brought into the same dialogue box you use to upload graphics to your assets. Click on upload new and browse for the image you want to bring in. Enlarge it until it fits with in the cropping space so you are viewing the full drawing you want to bring onto your main stage. Give it a name in the “label” box, hit crop and it will bring you back to your main stage. Click on the add custom graphic button to go back into your dialogue box, click on the drop-down menu to pick the layout you just uploaded. Hit on the “assign selected graphic” button and it will show up in the left column. Click on the okay button to bring the image into the main stage. Some of your assets have a web page linked to them. Once you’ve dragged and dropped an asset into your main stage, if you notice on the properties panel that there’s a button that says “visit web page”, then you can click on that button and go directly to that manufacturers website. Some of your objects from your assets panel will have additional information about the item. When you click on an object and go to your properties panel, if you see a button that says “3D properties”, then you know this object has some additional information and specifications that can help you. Click on the button and it will give you dimensions and sometimes different textures or finishes for that particular item. The dimensions that are shown are the “Z-height” which is the overall height of the object and “elevation” which is the spacial relation to the ground. For instance, if you want to raise the item up off the ground, you can put a dimension in the elevation box and it will raise the item up. Some of the 3D properties have the ability to add a video. If you have a flat screen or graphic component on an exhibit that allows you to do so, just click on the “select a video” drop-down menu, pick your video and hit okay. If you click on your object and the go to your properties panel, you see a picture of your product in the “product preview” section. If you click on the picture you will be brought into the manufacturers’ website where you can get additional information on the product. After you’ve clicked on your 3D button in your button bar, it will take you into your 3D viewer where you can see your work in 3D! You’ll notice along the bottom of your screen on the left side there are several icons to choose from. If you click on the third icon from the left, that is your “orbital cam.” This feature will allow you to spin around through your space and view it at different angles. You can manually zoom in and out of the space or use the arrows on your keyboard to navigate through. Your “walkthrough cam” is the icon that is farthest from the left. This feature allows you to walk through your space. You can either manually travel through it or use the arrows on your keyboard. Your “3D Mode Snapshot Button” is the second button from the left. If you want to take a picture of the screen to save it, just click on that icon and it will give you the option of saving to your computer or canceling the command. The 3D “settings” button is the first button from the left. This is where you go to change the screens background color or animate an object. To close the settings section, just click on the settings icon and it will hide the settings box. To change your background color in 3D, just click on “settings” button and it will open up a box where you can pick from a palette of colors and images. Click on the color/image you would like to use and see the background of the screen change right before your eyes. When you are finished in your 3D viewer, just click on the box in the upper right-hand corner of your screen and you will be back in your 2-dimensional main stage space. When you’re ready to print your work, just go to your button bar and click on the print icon. Once you’re in the dialogue box and previewing your work, you can adjust the way your layout will appear on paper by sliding the bar to zoom in and out. You can also click on the arrows and move the layout around. To bring it back to center just click on the box in the middle of the arrows. You have the option of “landscape” or “portrait” for printing out your layout. You can choose from two different options for your paper size. You can adjust the DPI (dots per inch) by clicking on the drop-down menu. Once you have it set up the way you want it to look when printed, click on the “create PDF” button and you can either save your layout as a PDF into a folder or print it out. To exit out of the print dialogue box, just click the box in the upper right-hand corner.